The genus Burkholderia is an emerging source of novel natural products chemistry, yet to date few methods exist for the selective isolation of strains of this genus from the environment. More broadly, tools to efficiently design selection media for any given genus would be of significant value to the natural products and microbiology communities. Using a modification of the recently published SMART protocol, we have developed a two-stage isolation protocol for strains from the genus Burkholderia. This method uses a combination of selective agar isolation media and multiplexed PCR profiling to derive Burkholderia strains from environmental samples with 95% efficiency. Creation of this new method paves the way for the systematic exploration of natural products chemistry from this important genus and offers new insight into potential methods for selective isolation method development for other priority genera. The online version of this article ( https://doi.org/10.1007/s10295-018-02121-x) contains supplementary material, which is available to authorized users. Isolation of specific taxa from the environment remains a significant challenge in the field of microbial natural products [17, 35]. Current methods are typically complicated and inefficient, limiting efforts to study priority organisms identified by genome mining or other prioritization approaches. Frequently these isolation methods require time-consuming stages including pre-treatment with heat or desiccation, empirical testing of suitable media components [5, 30], secondary biochemical testing to confirm isolate identities, and often multiple dilution steps to prevent overgrowth of untargeted organisms . Selective isolation of specific taxa from the environment is often focused on a single species or small group of bacteria from a genus of interest [14, 18, 26, 57]. Augmentation of selective media to include additional members of a selected genus can require inclusion of many more selective components, which requires testing of large numbers of media components and conditions . Morphological distinction of isolated colonies can also be difficult, resulting in confusion of target organisms with other related genera . Selection of environmental isolates is also dependent on the focus of the study for which they are obtained. For example, studies that focus on the degradation of certain chemical constituents may not discriminate based on taxonomic affiliation [16, 19, 37, 56, 72, 75, 76, 83]. Alternatively, isolation methods may be designed to target specific pathogenic genera, and bias for pathogenic strains over broad coverage within the genus [20, 26, 30, 62]. We were interested in developing a systematic isolation method for isolates of the genus Burkholderia due to their value as an emerging source of structurally unusual natural products. Recent advances in bioinformatic investigation of bacterial genomes have illuminated this genus as an underexplored resource for natural product discovery . This has been supported by the isolation of a large number of novel natural product structures from a select set of strains of this genus (Fig. 1) [13, 27, 42, 44, 68]. However, current selection methods for Burkholderia are mostly focused on isolating pathogenic strains for clinical and crop management applications. There exists a wealth of literature focused on methods for isolating strains from the Burkholderia cepacia complex (Bcc) [25, 49, 58, 78, 79]. Organisms from this group are of significant concern for immunocompromised patients and those with cystic fibrosis [40, 45, 54]. Other studies have focused on the isolation of B. pseudomallei and B. mallei, the causative agents of glanders [5, 14, 18, 20, 30, 77]. Several additional studies have prioritized plant-associated species, both pathogenic and plant-beneficial strains [1, 12, 70]. The area of Burkholderia taxonomy is currently undergoing revision, with many of the plant-beneficial strains being proposed as members of the new genera Paraburkholderia or Caballeronia [9, 64]. To date these beneficial organisms have primarily been isolated during campaigns searching for nitrogen-fixing bacteria capable of increasing root nodulation for enhanced crop growth [6, 12, 70]. Annotated genome sequence data has become readily available for many classes of microorganisms and can be leveraged to predict which media constituents can be used to enhance the growth of target organisms. In a recent study, Kawanishi et al. developed selective media based on two selective agents using a new computational method termed SMART that was designed to evaluate candidate media additives . This method laid the foundation for our investigation, but was highly targeted to individual organisms of interest rather than a group of organisms. 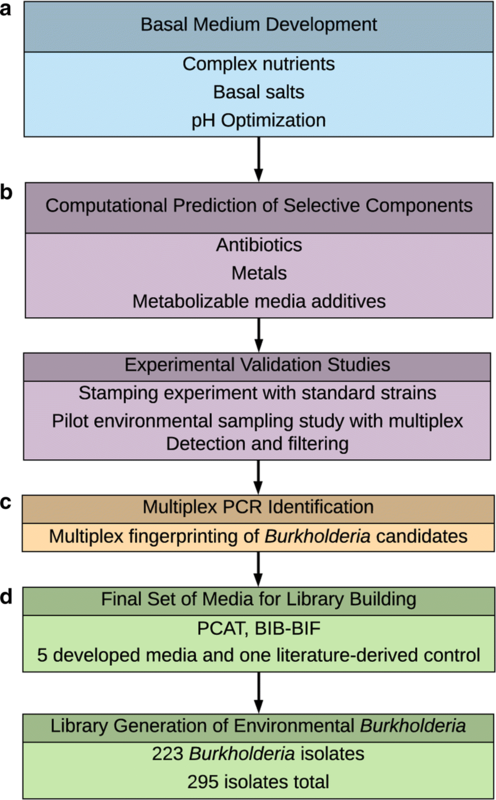 We sought to modify this approach to simultaneously predict selective media components for many members of the genus Burkholderia, while suppressing the growth of undesirable environmental organisms. This strategy involved four main stages: (1) design of Burkholderia-selective basal medium, (2) identification of additives (antibiotics, metals, carbon, and nitrogen sources) that increased selectivity, (3) creation of multiplexed PCR method to validate selected isolates, and (4) validation of the final method through an environmental sampling campaign (Fig. 2a–d). This method created a set of five new generalized selection media to isolate Burkholderia species from environmental samples. Validation of this new approach through environmental sampling yielded 223 Burkholderia strains from 49 environmental root samples with a 95% recovery rate for the genus of choice. Burkholderia thailandensis E264 (ATCC 700388) was used as a positive control for all experiments. All negative control strains were isolates from our in-house microbial library. Identities of these negative control strains were obtained by 16S rRNA gene sequencing and BLAST homology (Table S1). All subsequent isolates were identified using this method. Complex nutrients yeast extract, beef extract, peptone, and nutrient broth were tested for selectivity at the single concentration of 5 g/L in MilliQ water. To each of these complex nutrients was added 3 g/L of a phosphate source. Individual phosphate sources tested were KH2PO4, K2HPO4, and (NH4)3PO4. These were also tested in the combinations KH2PO4 with K2HPO4, KH2PO4 with NH4H2PO4, and K2HPO4 with NH4H2PO4 at 1.5 g/L each for a total concentration of 3 g/L to afford final basal media (Table S11). Cultures of B. thailandensis E264 and negative control organisms were grown independently in 96-well plates and growth evaluated by OD600 measurement. Negative control organisms were grown in a single mixed culture to mimic the complex environments typically encountered in environmental isolation studies. The B. thailandensis positive control was grown as a monoculture. 10 µL aliquots of positive and negative control cultures were inoculated separately into 200 µL of different basal media combinations in 96-well microtiter plates (Table S2) and absorbance values obtained at 0, 24, 48, 72 and 96 h. The average difference in absorbance between B. thailandensis and the untargeted organism mixture at each timepoint was determined to characterize the selection potential of different media combinations. We then tested both B. thailandensis and negative control monocultures independently at a range of pH values in the same basal medium (5 g/L yeast extract, 3 g/L KH2PO4), which identified pH 5.5 as the optimal pH for selectivity. The KEGG Genes module was queried for the presence of annotated resistance genes for antibiotics and metals within a set of targeted and untargeted organisms. Compounds were searched by term in Table S4. Each resistance gene-organism pair was then grouped by organism type. Compounds to which at least 25% of the Burkholderia group was resistant and which had a higher percentage of resistant strains in the Burkholderia set than untargeted organisms were deemed selective (Figure S3). This list of compounds was then prioritized by efficacy and price for antibiotics and toxicity implications for metals. Antibiotics were added to the basal medium at a concentration of 100 mg/L. Metals were added at concentrations of 292 and 85 mg/L for NiSO4·6H2O and CuSO4, respectively. Carbon and nitrogen sources were tested for predicted selectivity using the KEGG Compound module. To predict selectivity, the list of both Burkholderia and untargeted organisms (Table S3) was used for all queries. Each organism was paired with 220 compounds from KEGG Compound in the PathComp module (Table S5). The organism-compound pairs were investigated for their annotated ability to transform the test compound into α-d-glucose-6-phosphate (C00668) with a cut off length of 7 enzymatic steps. The total number of possible pathways was then tabulated and compared between the two groups of organisms. Compounds were prioritized based on the ratio of results for Burkholderia compared to untargeted organisms. Compounds that could be metabolized by at least 25% of Burkholderia strains and which could be metabolized by at least 25% fewer untargeted organisms than Burkholderia were prioritized for further testing (Fig. 3). From this list, three sources (isocitrate, D-tagaturonic acid, and 3-sulfino-l-alanine) were omitted due to issues with compound availability or cost in large-scale sampling efforts. Each predicted selective carbon and nitrogen source was then independently incorporated with the basal medium at 1 g/L concentration. Glycerol stocks of 12 untargeted organisms and 12 Burkholderia isolates from our existing library were thawed and 100 µL of each isolate was dispensed into a different well of a flat-bottom 96-well plate for pinning onto solid agar. Four technical replicates were included for each isolate (Table S6). 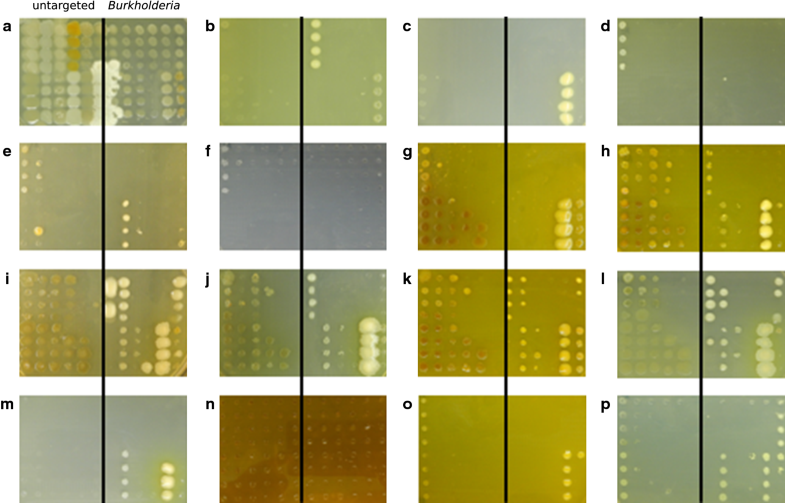 The plate was divided by organism group with untargeted isolates in the left six columns and Burkholderia species in the right six columns (Fig. 4). Liquid stocks were pinned using a cryo-replicator onto large agar plates (150 mm). Plates were incubated for 7 days at 30 °C, and photographs of growth taken daily. Environmental samples were collected from shallow plant roots in British Columbia (Table S7). Briefly, alcohol-sterilized tweezers, scissors, and scoops were used to reveal roots; a small portion of the root was cut and placed into a sterile 50-mL centrifuge tube (Falcon) with a small amount of surrounding soil. Latitude and longitude coordinates were obtained using a handheld GPS, and identification photographs taken of each plant. Tubes were sealed with the cap while in the field but this cap was replaced with parafilm as soon as possible on returning to the laboratory. Samples were stored a 4 °C prior to processing. Samples were processed by removing small portions of root and soil material from the collection tube and transferring to a 15-mL centrifuge tube (Falcon). Each sample was diluted with sterile 1× PBS buffer to cover the soil and root material in the tube (approximately 1 mL), vortexed at the maximum setting for 30 s and allowed to precipitate for 30 min. From each sample, 100 µL aliquots were spread onto each of the 6 selection media plate types and incubated at 30 °C for 5–7 days. After incubation, unique colonies were picked based on variations in color and other morphological characteristics using a sterile plastic loop, inoculated onto LB agar plates (25 g/L, Fisher Scientific) and incubated at 30 °C for 48 h. Single colonies were then picked to inoculate freshly autoclaved LB liquid media (10 mL) which were shaken at 200 rpm at ambient temperature overnight to prepare cultures for DNA purification. DNA was extracted from each turbid overnight culture using the Promega Wizard Genomic DNA Purification Kit according to the Gram-negative bacteria protocol. Simultaneously, 500 µL of culture was added to an equal volume of sterile 1:1 glycerol/water in cryo-microcentrifuge tubes for preservation. DNA concentrations were measured using a SpectraDrop Micro-volume Microplate with a Spectramax i3x plate reader (Molecular Devices). Each sample was suspended in 2 µL of resuspension buffer and this rehydration buffer from the DNA purification kit used as the blank for each plate in three technical replicates. DNA samples from each isolate were then used for PCR experiments. Four primer pairs were tested individually according to previously reported cycling conditions (Table S8). Reactions were performed in 50 μL volumes containing 25 μL 2× MasterMix with dye (ABM), 1.5 μL of each set of primers (0.15 μM final concentration), and 22 μL of nuclease-free water and template DNA (up to 1 μg DNA per reaction). PCR products were confirmed by standard gel electrophoresis (1% agarose in 1× TAE buffer) at 100 V for 30 min (BioRad, Mississauga, ON). Cycling conditions were 95 °C for 5 min, 35 cycles of 95 °C for 60 s, 59.5 °C for 60 s, and 72 °C for 90 s, final extension 72 °C for 10 min. Reactions were performed in 50 μL volumes containing 25 μL 2× MasterMix with dye (ABM), 6 μL of each set of primers (0.15 μM final concentration each), and 13 μL of nuclease-free water and template DNA (up to 1 μg DNA). PCR products were confirmed by standard gel electrophoresis at 100 V for 30 min (BioRad, Mississauga, ON). Bands were visualized using a GENi UV-transilluminator (Syngene, Frederick, MD). Samples putatively identified as Burkholderia-“positive” were defined as those displaying fingerprints with all four bands present (1300 bp, 510 bp, 498 bp, and 437 bp). Occasionally, Burkholderia strains lacked one of these four primer products, most commonly the band at 1300 bp. Samples not from the genus Burkholderia often showed no PCR products, or lacked bands at 1300 bp, 510 bp, and 498 bp. 16S rRNA gene PCR were performed in 50 μL volumes containing 25 μL 2× MasterMix with dye (ABM), 2.5 μL of universal primers 8F and 1492R (0.15 μM final concentration)(Table S8), and 20 μL of nuclease-free water and template DNA (up to 1 μg DNA per reaction). PCR products were confirmed by standard 1% agarose gel electrophoresis at 100 V for 30 min. PCR products were purified directly from PCR tubes using the QIAquick PCR Purification Kit according to the manufacturer’s protocol (Qiagen). DNA concentrations were determined using the microplate reader as described above. PCR products were sent to UBC-NAPS sequencing service (UBC, Vancouver, BC) with the same 8F and 1492R PCR primers for sequencing. Contigs were generated using CAP3 . BLASTn searches were conducted for all contigs and restricted to the 16S ribosomal RNA sequence database. Results were tabulated for each isolate with the accession number and the percent identity of the top BLAST homolog only (Tables S9 for pilot sampling with all 20 media and Table S10 for full scale sampling with five best candidate media). Maximum likelihood 16S rRNA gene sequence consensus trees were created for Burkholderia and untargeted isolates in MEGA7 . Sequences were aligned using MUSCLE and a ML tree was constructed with 1000 bootstrap replicates using the Tamura-Nei model . All positions containing gaps and missing data were eliminated. The Burkholderia tree (Fig. 7) was constructed of 366 sequences consisting of the 223 isolates from this study and 143 reference sequences. References sequences came from the top BLAST homolog as well as a list of all accepted Burkholderia species . There were a total of 1018 positions in the final dataset. 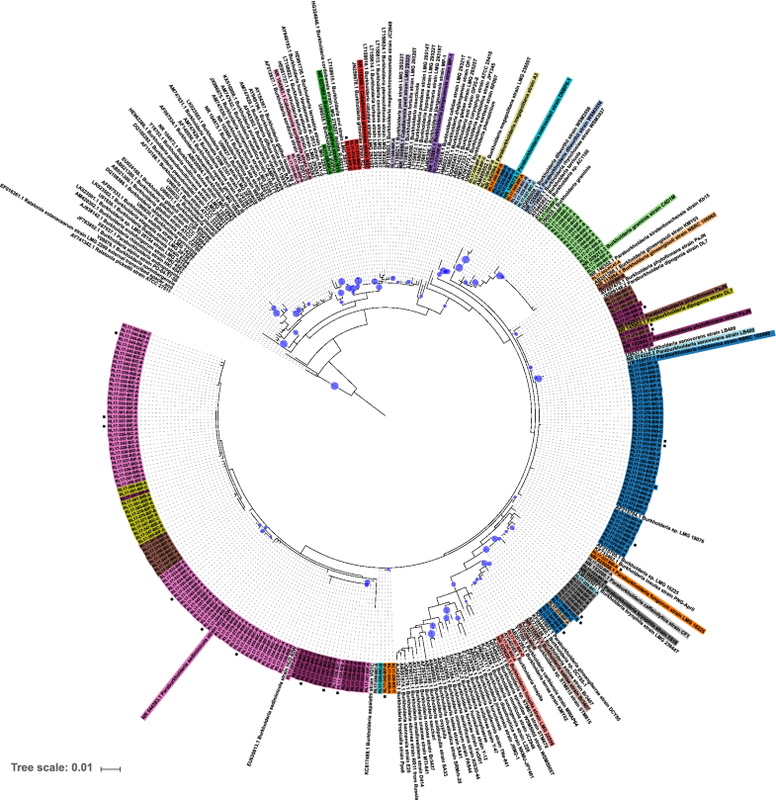 The full tree with Burkholderia and untargeted organisms (Figure S6) was constructed of 417 sequences consisting of all 295 isolates from this study and 122 reference sequences. References for Burkholderia strains in this tree included the list from the recent phylogenomic analysis of Burkholderia , and references for the untargeted organisms came from the top BLASTn homolog for that organism. There were a total of 822 positions in the final dataset. The annotated trees were generated using iTOL . To evaluate different basal media recipes, a test organism panel was required. Burkholderia thailandensis E264 ATCC 700388 was selected as the positive control organism. This species has been studied extensively for its secondary metabolite production  and was, therefore, considered an appropriate type strain of this genus. Untargeted negative control organisms listed in Table S1 were derived from our existing environmental isolate library. Each of the 12 untargeted organisms was selected because they are known to inhabit environments where Burkholderia strains are prevalent, specifically plant rhizomes. To develop the basal medium, we tested both a range of complex nutrient sources (yeast extract, beef extract, peptone, and nutrient broth) and a set of different phosphate sources (KH2PO4, K2HPO4 and NH4H2PO4). Phosphate sources were tested in combination with complex nutrients at concentrations of 5 g/L and 3 g/L, respectively. The phosphate sources tested included KH2PO4, K2HPO4 or NH4H2PO4 at 3 g/L as the sole phosphate source, or as combinations (KH2PO4 with K2HPO4, KH2PO4 with NH4H2PO4, and K2HPO4 with NH4H2PO4) at 1.5 g/L each for a total concentration of 3 g/L. Each of these phosphate sources was combined with a single complex nutrient source (Table S2). To test relative growth of targeted and untargeted strains, cultures of positive and negative control organisms were grown independently in 96-well plates and growth evaluated by OD600 measurement. Negative control organisms were grown as a single mixed culture to mimic the complex environments typically encountered in environmental isolation studies. The Burkholderia thailandensis positive control was grown as a monoculture. 10 µL aliquots of positive and negative control cultures were inoculated separately into 200 µL of different basal media combinations in 96-well microtiter plates (Table S2) and OD600 values obtained at 0, 24, 48, 72 and 96 h. The difference in OD600 between B. thailandensis and the untargeted organisms mixture was determined to characterize the selection potential of different media combinations. Overall yeast extract showed the highest growth difference between B. thailandensis and the untargeted organisms, but only yeast extract in combination with KH2PO4 maintained this selectivity across all time points (Figure S1). This combination of components was, therefore, selected as the foundation for basal medium development. Burkholderia strains are known to tolerate low pH environments . To determine the optimal pH for Burkholderia selectivity, we tested both positive and negative control cultures independently at a range of pH values in the same basal medium (5 g/L yeast extract, 3 g/L KH2PO4). At pH values below 5.0, organism growth was very limited. The basal medium buffered to pH 5.0 or 6.0 showed the highest selectivity for Burkholderia (Figure S2). Above pH 6.0 there was little selectivity for Burkholderia thailandensis over the control group. Therefore, the basal medium of 5 g/L yeast extract and 3 g/L KH2PO4 was buffered to pH 5.5 for further study. Fungal overgrowth of isolation plates is a common challenge with bacterial environmental sampling campaigns. To address this issue, we investigated the use of antifungals for suppression of unwanted fungal growth. Cycloheximide is a common antifungal additive for environmental selection media for a variety of bacterial species, including many of the published Burkholderia selection media. In early testing, we found cycloheximide to be insufficient to suppress fungal growth, even at a concentration of 100 mg/L. To resolve this issue, we tested nystatin and econazole (the nitrate salt) as candidate replacements or additions to cycloheximide. Each antifungal was tested individually at 100 mg/L, as pairwise combinations (nystatin–cycloheximide, nystatin–econazole, cycloheximide–econazole—total 200 mg/L antifungal), and as a combination of all three (cycloheximide, nystatin, and econazole—total 300 mg/L antifungal). The antifungal(s) were added to the basal medium and five environmental collections were suspended in sterile 1× PBS and plated on the seven plates, for a total of 35 plates. Plates were incubated for 5 days at 30 °C and observed for fungal growth. Only the combination of all three antifungals, each at a concentration of 100 mg/L, was sufficient to suppress growth of all fungi. Therefore, the final basal medium was defined as 5 g/L yeast extract, 3 g/L KH2PO4, and 100 mg/L each of cycloheximide, nystatin, and econazole nitrate salt buffered to pH 5.5. To increase selectivity for the target genus over untargeted strains we employed computational methods to identify additives that were selectively tolerated (metals and antibiotics) or metabolized (carbon and nitrogen sources) by Burkholderia species. Firstly, a set of test organisms was selected for which full genome sequence data were available. Secondly, these genome sequences were explored to identify resistance genes or metabolic pathways that were differentially present in Burkholderia vs. untargeted strains. 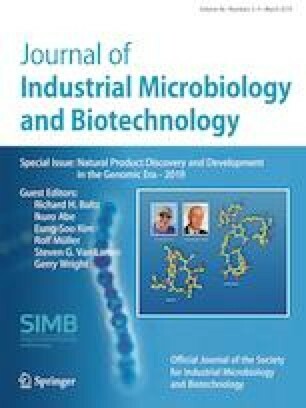 Finally, computationally selected additives were tested experimentally using a panel of both Burkholderia and untargeted strains available in our laboratory to evaluate selectivity and determine optimal concentrations for addition. Organisms for computational studies were selected from the list of whole genome sequences deposited in the KEGG Organism module . Organisms were selected in two groups: Burkholderia, including organisms from the recently described genus Paraburkholderia (n = 24) and untargeted organisms from the class Gammaproteobacteria, including members of the genera Serratia, Hafnia, Rahnella, and Pseudomonas (n = 27) which we had previously encountered in early sampling efforts (Table S3). The list of Burkholderia species de-prioritized organisms in the Burkholderia cepacia complex in favor of strains derived from rhizome environments. Antibiotics and metals (Table S4) were evaluated for selectivity using the KEGG Gene module. Scanning each genome for annotated resistance genes against each candidate additive determined the resistance profile for each organism. Candidate additives were scored based on the percentage of organisms from each group (Burkholderia vs untargeted) with resistance or tolerance to that antibiotic or metal. Candidates which showed selectivity for Burkholderia species over the untargeted set were prioritized for in vitro testing as additives to the basal medium (Figure S3). From our computational assessments fusaric acid, bacitracin, and acriflavine were prioritized as candidate antibiotics while NiSO4·6H2O and CuSO4 were selected as metal additives. Each additive was tested in serial dilution from 0.04 to 5.0 g/L in 96-well microtiter plates. Growth of the B. thailandensis control and mix of untargeted organisms from the basal media development was monitored by OD600 readings. Selectivity for Burkholderia strains was determined by comparing the MIC values for each additive against B. thailandensis versus the mix of untargeted organisms. For the antibiotics a final concentration of 100 mg/L was selected as the optimal concentration for selective Burkholderia growth. For the metals, final concentrations were 292 mg/L NiSO4·6H2O and 85 mg/L CuSO4. Carbon and nitrogen source predictions were performed by adapting the SMART method recently developed by Kawanishi, et al. . Briefly, the KEGG pathway mapping tool PathComp was used to identify carbon and nitrogen sources that could be readily transformed into key primary metabolites by Burkholderia species, but were not readily metabolized by untargeted strains. 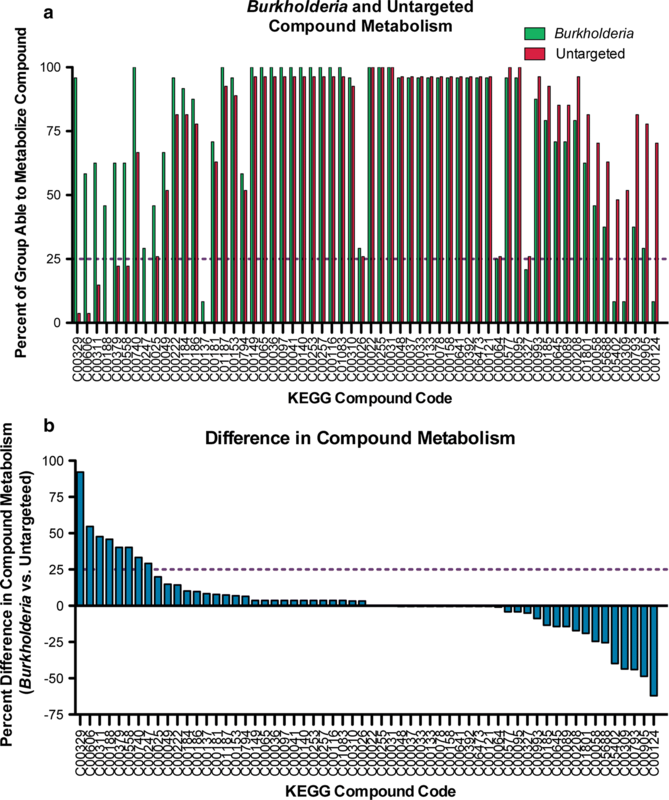 PathComp uses annotated genomic information to propose enzymatic reaction pathways between pairs of primary metabolites. Following the SMART protocol, we selected alpha-d-glucose-6-phosphate as the target metabolite. For source metabolites we prioritized carbohydrates, amino acids, organic acids, and vitamins from the list of compounds with biological roles in the KEGG Compound module (Table S5). We modified the original method by reducing the allowed number of enzymatic steps from 20 to 7 between starting sources and the final compound. Each organism from Table S3 was queried for its ability to transform each candidate carbon and nitrogen source into alpha-d-glucose-6-phosphate. Sources were prioritized based on the percentage of Burkholderia strains able to metabolize each source compared to untargeted strains. Selective compounds were defined using two selection criteria. Firstly, they had to be metabolized by at least 25% of the species in the targeted Burkholderia group. Secondly, there had to be a difference of at least 25% between the percentage of Burkholderia strains that could metabolize the compound, and the percentage of untargeted strains that could perform the same transformation. These criteria identified 8 compounds for consideration (Fig. 3). Of these 8 compounds, five (l-sorbose, D-glucosamine, xylitol, l-threonine, and d-serine) were experimentally evaluated for optimal concentrations, while the remaining three were either not commercially available or were too expensive for incorporation in large-scale sampling efforts. Based on the results of the SMART analysis, we designed a suite of 18 selection media for experimental investigation. These included variations on the basal medium (BIG, BIB, BIH), media containing the basal components with a single additional C/N feedstock and one or more antibiotics, (BII, BIJ, BIK, BIE, BIL, BID) and media containing the basal components and two C/N feedstocks (BIC). Carbon and nitrogen source additives were included at 1 g/L. In addition, we included two media from the published literature in this area (PCAT and BAc). These media have previously been used for selecting environmental isolates of non-pathogenic species of Burkholderia and were valuable as positive controls against which to evaluate the effectiveness of our new method. Three media inspired by previous literature reports were also included (BID, BIN, BIO). These media incorporated the literature-derived carbon and nitrogen feedstocks l-arginine (BID; identified from Bergey’s Manual of Systematic Bacteriology  as suppressing the growth of Serratia, Ewingella, and Rahnella), azelaic acid with tryptamine (BIN), and azelaic acid with L-citrulline (BIO). A fourth literature-inspired medium (BIP) replaced bacitracin with nalidixic acid. Finally, we chose to investigate the potential of each of the selective components as a selective sole carbon source. To test this, we replaced the complex yeast extract from the basal medium with 5 g/L of selected C/N feedstocks (d-serine, L-sorbose, l-arginine, l-threonine or xylitol; BIQ, BIR, BIS, BIF, BIT, respectively). The panel of candidate media from Table 1 was evaluated for selectivity towards Burkholderia using two independent methods. Strains of untargeted organisms (n = 12) and Burkholderia (n = 12) were selected from our in-house isolate library (Table S6). Four technical replicates of each of these 24 strains were pinned onto solid agar using a 96-pin plate replicator. Plates were incubated at 30 °C for 7 days, and images of the plates taken every 24 h. Growth was evaluated qualitatively based on the presence or absence of colonies as well as the density of the colonies present relative to an LB agar control plate. Plates were deemed selective if they displayed one of two phenotypes: (1) only Burkholderia colonies were observed, even if overall growth was very low, or (2) growth was observed from both groups of organisms but dominated by the targeted Burkholderia colonies. PCAT, BAc, BIB, and BIE (Fig. 4b, c, e, and m respectively) were indicative of selective phenotype 1, with low growth observed. BIC, BID, BIK, and BIF (Fig. 4i, k, l, p) were indicative of selective phenotype 2, with enhanced growth of Burkholderia species relative to untargeted organisms. The relative difference in isolate growth between Burkholderia and untargeted organisms with this phenotype was more difficult to distinguish for both BIC and BID but was clear for BIF. The other media showed either similar growth of organisms from each group, or were dominated by untargeted organisms, and were thus not considered selective. Concurrently, four environmental samples were inoculated at a single dilution in 1X PBS onto each selective medium from Table 1 after vortexing to evaluate efficacy of isolating Burkholderia from complex environments. After inoculation, plates were incubated at 30 °C for 5–7 days, and all morphologically distinct colonies isolated onto LB agar. These isolates were incubated at 30 °C for 1–2 days prior to inoculation into liquid LB for overnight culture (25 °C at 200 rpm). After incubation, DNA was extracted from each sample using the Wizard Genomic DNA Purification Kit from Promega according to the manufacturer’s protocol and quantified prior to 16S rRNA PCR experiments for isolate sequencing. In total, 94 isolates were picked and subjected to 16S rRNA sequence analysis. A total of 84 isolates (89%) were identified as Burkholderia by BLAST homology from the 20 tested selective media. These results were analyzed as a function of the medium from which the isolates were derived shown in Fig. 5a. PCAT, BIB, BIC, BID, BIE, and BIF showed similar selectivity as observed in the stamping experiment. Other media however, were not as consistent between the two experiments. In particular, BAc showed very little growth in either experiment, but in the sampling test, recovered only one untargeted organism. Other media showed improvement from the original stamping experiment selectivity. BIJ, BIK, BIO and BIP recovered more Burkholderia isolates than were expected from the stamping results. While the total recovery of Burkholderia isolates was satisfactory to this point, a full-scale sampling campaign would be impractical with so many media. Furthermore, morphological distinction of Burkholderia from the encountered untargeted organisms remained a challenge. To address these issues, we sought to develop a more rapid method of profiling isolates. To improve the throughput of large-scale sampling efforts we developed a PCR-based method for rapidly confirming candidate Burkholderia isolates from our selection media. A number of genus-specific primers have been developed for Burkholderia in recent years [2, 41, 65, 69, 71]. To assess the ability of these primers to differentiate between targeted and untargeted organisms each primer pair was tested against the panel of 24 control strains used in the pinning experiments. In all cases individual primer pairs gave strong PCR products with DNA from Burkholderia strains (Figure S4a-d). However, each primer pair also afforded PCR products for one or more members of the untargeted control group. Based on the variability of PCR products from each primer pair against untargeted organisms we hypothesized that a multiplexed primer pair set would uniquely identify isolates from the genus Burkholderia. Performing multiplexed PCR with all four primer pairs produced a selective fingerprint for all Burkholderia strains in the test set, while correctly eliminating all untargeted strains (Figure S4e). We next evaluated the accuracy of this method using the full panel of 94 isolates from our initial sampling study. Each isolate was grown in liquid culture for 24 h, DNA extracted under standard conditions and the resulting DNA divided into two aliquots. The first aliquot was subjected to multiplexed PCR and bands were visualized using a GENi UV-transilluminator (Syngene, Frederick, MD). The second aliquot was subjected to 16 s rRNA analysis using 8F and 1492R universal primers and the resulting PCR primer products sequenced by the Sanger method. Comparing these two characterization methods indicated that the multiplexed PCR approach was in generally good agreement with the results obtained from 16S rRNA sequencing (Fig. 5b). For 12 of the 15 media that produced isolates, multiplex PCR correctly binned all or all but one of the isolates into Burkholderia or untargeted groups. Overall the multiplexed PCR method correctly eliminated strains that were not from the genus Burkholderia, with a low false positive rate (6%). On the basis of these data we prioritized a panel of six selection media for environmental sampling: the established selection medium PCAT, and five media developed in this study. Together this panel offered good coverage of Burkholderia diversity, while limiting the selection of strains from untargeted genera. The justification for the use of these six selection media (PCAT, BIB, BIC, BID, BIE, BIF) is as follows. PCAT is an established selection medium that has been used successfully for the isolation of environmental Burkholderia species [53, 63, 79]. This medium showed very strong selection in the stamping experiment (Fig. 4b), with only two Burkholderia isolates displaying growth. Furthermore, 7 of the 8 environmental isolates from this medium were identified as Burkholderia species (Fig. 5a). This medium was included as a benchmark against which to evaluate the performance of the selection media developed in this study. The first selection medium (BIB) was the basal medium including both the metal additives (NiSO4·6H2O and CuSO4) and MgSO4·7H2O. This medium showed the greatest selectivity of all the basal media tested in the stamping experiment (Fig. 4e), returning 7 of 8 isolates as Burkholderia (Fig. 5a). The second selective medium chosen (BIC) was the basal medium with selective additives L-sorbose and hydroxyproline and the antibiotics fusaric acid and bacitracin. This medium showed superior selectivity to either of the other two L-sorbose-containing media in the stamping experiment (Fig. 4i). In the pilot sampling experiment, BIC returned ~ 80% Burkholderia isolates. The third selective medium (BID) contained the basal medium plus l-arginine, acriflavine, and bacitracin. This medium displayed similar selectivity to BIC in the stamping experiment, with moderate growth of the Burkholderia standards (Fig. 4k). Further, this medium returned five of the six isolates from the pilot sampling experiment as Burkholderia species after BLAST identification. The fourth selective medium (BIE), contained D-glucosamine, fusaric acid, and bacitracin as the additives to our basal medium. These additives were predicted to be highly selective based on the KEGG Pathcomp analysis. Growth of isolates in the stamping experiment was quite low, but the only strains recovered were Burkholderia species (Fig. 4m). This selectivity was recapitulated the pilot sampling experiment (Fig. 5a) with only Burkholderia strains being recovered from this medium. The fifth and final selective medium (BIF) contained l-threonine, fusaric acid, and bacitracin as the selective additives. This medium did not contain yeast extract, which was replaced by the l-threonine additive (Table 1). Both l-threonine-containing media (BIK and BIF) showed moderate growth of Burkholderia isolates in the stamping experiment (Fig. 4l and 4p, respectively), but BIF showed greater suppression of the untargeted organisms (Fig. 4p). Both media recovered 100% Burkholderia species from the pilot sampling experiment, with similar number of isolates recovered (7 vs. 9). To evaluate the effectiveness of this newly developed method we performed an environmental sampling campaign of rhizome samples from the Southwest region of British Columbia, Canada. The objectives of this effort were to evaluate the efficiency of Burkholderia isolation from a broad cross-section of environmental samples, and to compare these results to those obtained using existing literature methods. 57 root samples were collected from 9 sites in British Columbia (Figure S5). Each sample was plated onto the prioritized isolation media from this study (BIB, BIC, BID, BIE, and BIF). Samples were also plated onto the literature isolation medium PCAT as an internal reference. Isolation plates were incubated at 30 °C for 5–7 days and reviewed daily for the presence of new colonies. Representative colonies of each distinct morphology were isolated on LB agar and incubated for 48 h at 30 °C prior to overnight liquid culture at 25 °C and 200 rpm. To characterize the efficiency of this new method all samples were subjected to both multiplex PCR analysis and 16S rRNA analysis, although in the normal workflow only those strains that were positive in the multiplex PCR step would be advanced for further analysis. In total, 295 isolates were picked from selection media and subjected to PCR analysis. There were a total of 215 (73%) multiplex-positive isolates and 80 (27%) multiplex-negative isolates from all selection media tested, with a majority of isolates derived from the selection media developed in this study (Fig. 6a). Only 6 of the 25 (24%) total isolates picked from PCAT were multiplex-positive. In contrast, 209 of the 270 (77%) total isolates picked from our five selection media were multiplex-positive (Fig. 6b). The resulting 16S rRNA sequence analysis indicated that the multiplex PCR-based filter could identify candidate Burkholderia isolates prior to 16S rRNA gene sequencing. A total of 202 of the 215 (94%) isolates that were multiplex-positive were subsequently identified as Burkholderia species by BLASTn analysis of 16S rRNA sequences from each isolate against the NCBI prokaryotic 16S sequence databank (Fig. 6a). Surprisingly, 21 of the 80 (26%) of the multiplex-negative isolates were also identified as Burkholderia, indicating a low false-positive rate, but a moderate false-negative rate. These results were re-analyzed as a function of selection medium to assess the efficiency of this new isolation method. As mentioned above, 6 of 25 isolates obtained from PCAT were multiplex-positive, but only 4 of those 6 isolates (16% total) were identified as Burkholderia by 16S rRNA BLASTn analysis against NCBI. By comparison, 81% of all isolates obtained from media designed in this study were multiplex-positive. After BLASTn analysis of the 16S rRNA gene sequences, 76% of all 295 isolates were identified as Burkholderia (Fig. 6b). Satisfyingly, the multiplex PCR results correlated well with the species identifications derived from BLASTn analyses, with 94% of multiplex-positive isolates being identified as Burkholderia species (Fig. 6c, d). The isolates were obtained from samples across just 9 sites in British Columbia, yet represent 20 of 122 currently listed species for the genus Burkholderia (Fig. 7) (http://www.bacterio.net/burkholderia.html). A majority of the isolates comprise only five species (B. sediminicola, B. caledonica, B. phytofirmans now Paraburkholderia phytofirmans, B. graminis now Paraburkholderia graminis, and Paraburkholderia dipogonis) represented by 73, 51, 35, 16, and 12 isolates, respectively. The remaining 36 isolates were attributed to 15 other species of the genus, with Paraburkholderia bryophila being the most abundant species among this group. This observation suggests that the isolation method may be general for the selected genus, and offers encouragement for extension of the sampling campaign to a wider geographic range to further increase species coverage in the Burkholderia isolate library. No preferential selection of Burkholderia species was observed for these selection media, which demonstrated evenly distributed taxonomic diversity (Figures S6-S8). Current natural products investigations have only considered a small number of species from the genus Burkholderia to date (denoted by blue arrows in Fig. 7). Genome-guided discovery efforts, driven by the wealth of genomic information for species such as B. thailandensis have culminated in the discovery of several new and important natural products (Fig. 1, compounds 1–5). This new method provides a facile and general isolation platform for Burkholderia that opens up significant new opportunity for natural products discovery from this genus. This conclusion is supported by recent efforts focused on understudied species such as P. graminis, which have already yielded a new class of siderophore containing a novel N-nitrosohydroxylamine functional group . In this study, we isolated multiple examples of several prominent Burkholderia species. This could be seen as a limitation of the technology, if the objective is the isolation of novel natural products chemistry. However, species identity as described by 16S rRNA gene sequence similarity does not strictly dictate the natural product potential for a given strain. As has been shown recently with Salinispora and Pseudoalteromonas, even closely related strains of the same species can harbor differential biosynthetic potential [10, 43, 85]. For this reason, this new library of Burkholderia species constitutes an exciting opportunity to discover the biosynthetic potential of as yet unstudied members of this talented group of microbes. Additionally, this systematic method for isolating this exciting genus opens a new avenue for the discovery of microbial natural products. There is a strong need in natural products research for new methods to improve the isolation of priority genera from environmental samples. Rates of compound rediscovery are increasing, and the field is actively exploring new sources of microbial diversity for natural products discovery [3, 8, 28, 29, 33, 39, 47, 50]. A recent analysis of natural products chemical diversity indicates that different classes of organisms produce fundamentally different chemistries . This conclusion is supported by genome sequence data, which is providing broad insight into the secondary metabolic potential of microorganisms and the taxonomic distribution of this biosynthetic machinery [4, 7, 23, 48, 82, 86]. Among microbial sources, Burkholderia are becoming recognized as an important genus for natural products discovery [11, 42, 59, 84]. 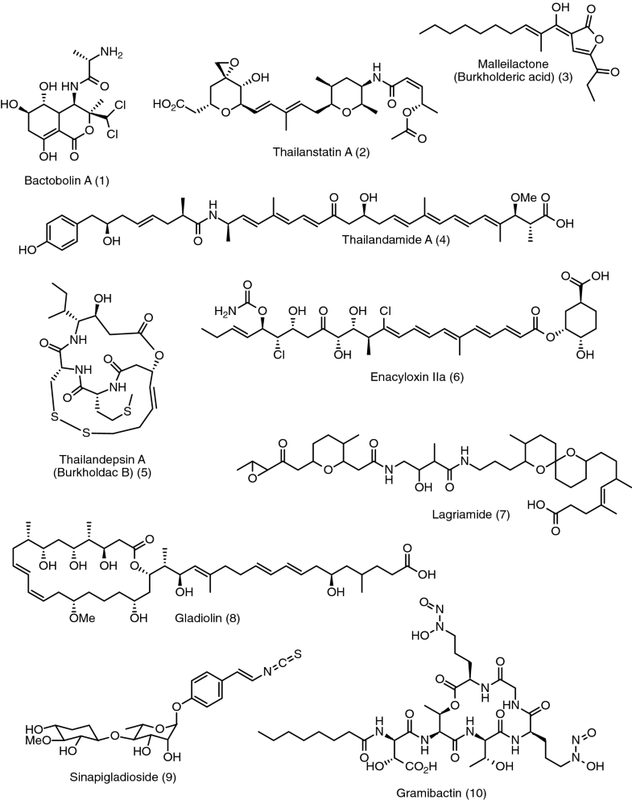 This genus has already yielded a number of important classes of compounds [15, 24, 27, 67, 74, 80, 81], and recent studies have demonstrated that the biosynthetic capacity of these organisms can be readily manipulated using small molecule elicitors and other tools [15, 22, 46, 52, 66]. To date these studies have largely been restricted to strains available in public culture collections (e.g., B. thailandensis E264; ATCC 700388). The limited study of natural products from Burkholderia to date is due in part to the challenge involved in systematically isolating Burkholderia strains from the environment. This is in turn hampered by the difficulty of efficiently developing new methods for selective microbial isolation. Fortunately, informatic tools are now providing methods to circumvent the previously laborious process of manual feedstock screening. Traditional approaches for media optimization involve either empirical scanning of media components  or modification of existing media through a stepwise process of feedstock optimization .These experimental methods are inherently slow and limit optimization to a small set of candidate additives [12, 30]. The recently developed SMART method  provides an efficient mechanism to computationally scan large numbers of potential feedstocks and highlight those that are likely to display selectivity for a given genus. In our hands a modified version of this approach allowed us to profile 245 additives and select 10 for experimental validation. The elimination of empirical additive selection was a contributing factor to the success of this study. In our experience, initial development of a basal medium with moderate selectivity for the target genus was an important precursor to screening selective additives. Application of the basal medium without additives aided in the isolation of closely related untargeted organisms for selectivity refinement. Choice of test organisms was critical for both computational and experimental components. Overall, iterative experimental and computational optimization provided an efficient approach to media development, yielding an isolation method with very high selectivity for the chosen genus. This approach worked best when the identities of untargeted organisms isolated from each experimental step were known and could be used in subsequent computational refinements to improve selectivity by selecting for features or additives that were poorly tolerated by the untargeted set. To select metals and antibiotics for experimental validation we examined the prevalence of resistance genes in both Burkholderia and untargeted genomes from the KEGG Gene module. For metals, this analysis identified copper and nickel as promising candidates. In the case of copper, 98% of Burkholderia strains possessed at least one resistance gene, versus 91% for the untargeted organisms. For nickel the values were 93% and 87%, respectively. In an analogous fashion, fusaric acid, bacitracin, and acriflavine were chosen as the antibiotic additives because of the difference in resistance frequencies between Burkholderia and untargeted sequences. Although both metal and antibiotic resistance genes were relatively common within the full test set, experimental validation demonstrated that in general Burkholderia strains were tolerant to higher concentrations of both the selected metals and the antibiotic set than the untargeted strains. Finally, identification of carbon and nitrogen sources that were readily metabolized by Burkholderia strains was important for amplifying the selection efficiency of the other additives. Although no C/N sources were uniquely metabolized by Burkholderia strains, there were several examples of C/N sources that were only poorly metabolized by untargeted strains. By placing environmental samples under stress through the provision of selective C/N sources we were able to design conditions which strongly favored the growth of targeted organisms, improving the selection efficiency and prioritizing the growth of Burkholderia isolates. In addition to the creation of selective isolation media, the use of multiplex PCR screening significantly improved the efficiency of the isolation protocol. Unlike isolation of Actinobacteria or Myxobacteria, both of which have sporulating stages to their lifecycles that are easily identified by light microscopy, Burkholderia are difficult to differentiate by eye from other closely related Proteobacteria. PCR-based 16S-rRNA taxonomic identification is labor intensive for large libraries, increasing both time and cost for library preparation. Using only the selection media, 76% of isolates were of the correct genus, with the remaining 24% distributed amongst related genera including Pseudomonas, Dyella, Ewingella, Serratia, and Erwinia, and unrelated Firmicutes including Bacillus, Paenibacillus, Lysinibacillus, and Psychrobacillus. (Figure S6). Although no single primer pair was selective for exclusively Burkholderia strains, the multiplexed primer set was very efficient, raising the selection rate from 76% to 94%, with just 6% of multiplex-positive isolates found outside the genus Burkholderia. Although multiplex PCR screening was effective at identifying Burkholderia strains, there were a small number of instances where Burkholderia strains were incorrectly annotated as untargeted organisms. These false negatives were distributed throughout the taxonomic tree (Fig. 7). In summary, this new isolation method provides an efficient, straightforward strategy for the creation of large isolate libraries for a given target genus. Application of method to environmental sampling campaign yielded a new library of Burkholderia strains. This library is both large and diverse, containing over 200 isolates and having broad coverage of taxonomic diversity in the plant-beneficial clade. Moreover, this approach should be generalizable to other target genera, providing opportunity for the expansion of taxonomic space that can be readily explored for natural products discovery. DNA sequences have been deposited to GenBank with accession numbers M373327–M373749. For full details about strain accession numbers see supporting information. This work was funded by the Natural Sciences and Engineering Research Council RGPIN-2016-03962 (RGL) and the Coordenação de Aperfeiçoamento de Pessoal de Nível Superior (CAPES) no. 8074135 (JLB).